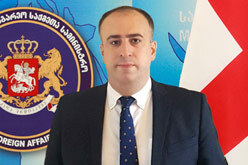 On 11 March 2015, the Georgian First Deputy Foreign Minister, David Dondua met Deputy Director of the Directorate for Political Council of the Council of Europe, Daniil Khoshabo and Political Advisor, Marsel Capi. The delegation of the Council of Europe visited Georgia to prepare the CoE Secretary General's 11th consolidated report on the Conflict in Georgia. Talking points included the current humanitarian and criminal situation in Georgia’s occupied territories, Russia’s actions in Georgia and in the region as a whole, as well assignature of the so-called “treaties” between the Russian Federation and the occupation regimes of Abkhazia and the Tskhinvali region. David Dondua and the delegation of the Council of Europe also focused on the importance of confidence-building mechanisms and on the issues discussed in Geneva Talks format. The recent political developments in Ukraine and the region were also underlined.